Great photos sell products. Learning to take high-quality product images is one of the very first priorities to focus on if you want your online audience to take a closer look at your listings. Online sellers can take quality photos without spending a fortune on equipment. Many use photo light boxes that fit on a table, or simply hang white cloth as a background. With resources that can easily be pulled together, you, too, can achieve great photographs for your product listings. You don't need the best camera money can buy to take great photos. Sure, it seems the camera with the most bells and whistles will produce a better photo, but the fact is almost any camera can take a perfect shot. What really matters are just a few tools equipped with the camera—which I'll tell you about in a minute—good lighting and some photography knowledge. First, some terms you'll want to learn include: depth of field, rule of thirds, lighting, ISO, exposure, white balance, shutter speed and aperture. A quick Google search with these terms should do the trick for you. Next, you'll want a digital camera with at least four-megapixel capability. Megapixels translate to image quality when a photo is viewed at a larger size. You really don't need anything above four megapixels unless you plan on making posters or billboard signs. It's also good to have a camera with manual settings and portrait, landscape, white balance and focus controls. Add to your photo studio a tripod, two or three dedicated lamps and something white. Your "something white" depends on how and where you want to set up your shot. As mentioned earlier, you can use a plain, white cloth of some sort and hang it on the wall, or purchase poster board to use as a background. Generally, what you're aiming for is a clutter-free background with a clean, professional appearance. There are also affordable studio light boxes available, or you can make your own with a cardboard box and tissue paper. Another suggestion, which has become quite popular on Pinterest, is using the combination of tracing paper taped to a bright window and foil to create a reflective surface. If you're taking pictures indoors, place a lamp on each side of your product, and another one above it. With the lights on, adjust their positions until shadows are washed out as much as possible. Actually, a hint of shadow creates a natural sense of depth. However, most photographers agree that natural lighting is superior to any alternative. You can get this light from a window source, overcast or open shade outdoors, or take advantage of beautiful morning and dusk lighting. Just try to keep harsh lighting out of the picture. To do this, create a setup that doesn't have really bright light and really dark shadows in the scene. With everything set up and some basic photography lessons under your belt, you're ready to point and click. Secure your camera on a tripod to avoid blurry results. Following the rule of thirds, position your viewfinder to take an overall shot of your product, and also zoom in to get some close ups. Most cameras allow you to hold the button halfway down so it can get a good focus on your setup. Don't bother taking the picture until you know there's no blur. 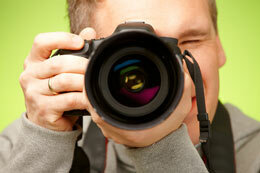 Take photos of your product from different angles; high, low, from the left, from the right, etc. When you go to select photos for your listings later, you'll find that some are more visually appealing than others based on the angle. If you're creating a stylized shot with props, use your knowledge of depth of field to create crisp product images with blurry backgrounds. In general, the landscape mode on your camera is set to make everything in the image focused, while portrait mode focuses on your subject and allows the background to blur. A professional photographer knows his craft so well that he shouldn't even need to use photo editing software to adjust his images. Online sellers, on the other hand, might appreciate a little extra technological assistance. Adobe Photoshop is fun, but expensive. A little research on your end can yield you a list of alternatives to choose from that are free or low-cost. You will want an editing program that lets you crop your photos, and perhaps even adjust color, tone, brightness and image size. Other editing tools that come in handy include smudge, selection, levels, eraser and clone. These functions are slightly more advanced, but worth the effort to learn. What's most important to point out here is that we want you to represent your product in the best light possible, but not in such a way that it misrepresents the item. As you make small adjustments to lighting, color and such, be sure it's accurate and natural looking. It's difficult to pack a perfect photo lesson into one sitting. There are many variables and new tricks you can only learn as you grow in your skills. Etsy has some wonderful photography tips on its blog, but one of the best tips is to simply practice. Great article, memorable suggestions & insightful. One important rule that I always forget is BATTERIES! I take a bunch of photos, load them up only to see washed out, yellowed and dim pictures. Fresh batteries or very good rechargeable ones are worth the investment. I'm having trouble taking really close-up photos of jewellery, since my Canon SLR which took great macro close-ups siezed up. Even with 2 new cameras I am unable to capture jewellery hallmarks eg in rings etc. Which one is good for thid job? I found article informatable and interesting. Will use lighting suggested and rule of thirds. Also start using tripod. Don't forget even if your using a phone you can get cheep little tripods for it, to get things nice and steady. Lighting is the photographer's greatest asset and responsibility. The camera is just a tool to capture what you have created with your lighting.